The peace sign symbol of the antiwar movement. The Antiwar Movement was one of two major cultural shifts in progress during the golden age of rock. It grew as the civil rights movement, perhaps helped by the acceptance of Race music (R&B) into Rock and Roll was just gathering steam (read more). At the same time, many people , including a large number of the youth of our country, began to question our country’s involvement in Vietnam. These were still conservative times, and maybe it was just that the kids were more open to questioning government authority, but it created a major division in our society. The Antiwar Movement set up a situation where it was us (teens) against them (the establishment). Perhaps it was because Vietnam wasn’t an official war … the government never actually declared war, and we never had clearly defined goals as in previous wars. There wasn’t a lot of commitment to fighting a “police action”. As the death toll continued to rise, teens of the 60s saw their friends get drafted, sent to Vietnam, and never return. On top of this,unlike previous wars that the country was familiar with, troops were “rotated”, brought home while the fighting was still going on, with first hand reports that the war wasn’t going well and we didn’t have a clear goal. By the late 60s, there were nearly half a million soldiers in Vietnam and the draft was claiming more and more guys. College campus protests arose across the country, and protest music became a lot stronger. Jefferson Airplane and The Grateful Dead mixed their protests with drugs, creating what became known as Acid Rock. By the time of Woodstock, flag burnings on stage were common and Jimi Hendrix’ version of The Star Spangled Banner let the world know that we saw our country in a different way than the establishment. As the war wound down, protest music faded, but the Antiwar Movement’s influence still lasts. Country music, a close relative of Rock, grew in popularity through the South as Rock antiwar tunes alienated conservative listeners. The dividing line between “Country territory” and the “Rock world” closely matches the Red State / Blue State, division in today’s politics. 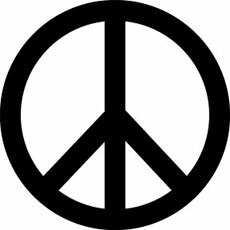 The Antiwar Movement Peace Sign was borrowed from a British nuclear disarmament movement and caught on quickly in the USA. It’s still so popular today that it has it’s own Unicode … that’s the computer code that makes letters and numbers. The code U+262E generates ☮. An alternative peace sign, the V Sign was borrowed from a WWII victory symbol. It’s origin was probably an expression of desire for the war to end. The V Sign has it’s own Unicode,U+270C which generates ✌. Note that the V Sign for peace is with the palm facing outward. Be careful how you use it. Facing inward is considered obscene and insulting in some cultures.